Guess what I was able to get my hands on recently? The Neutrogena® Light Therapy Acne Mask. I’ll go more into detail about this lovely product in a bit. But first, let’s talk about skin and routines. I’m continually trying to find the right answer to my hormonal break-outs. I have had the same routine for a year before deciding I should switch it up because the results weren’t there. I want to feel good about my skin, and I want to results to be permanent. That’s why I always look for things that will work with my skin. I have combination skin that is acne prone, so that’s why a routine is essential. I need a method so that I can figure out what works and what doesn’t work. Don’t you just want to feel good in your skin without having to apply an excess of products to your face? That’s how I think. I wish to achieve great skin without drying it out or making it red due to sensitivity. There are many products out there that are going to work on your skin, and they’re not working hard enough. It’s either that or the results aren’t longlasting, so you aren’t happy in the end. That’s how I feel about many products that I’ve used in the past. I want my skin to look new and glow without having to throw on multiple products. You have to put together a routine that works for your skin and benefits you in a way where you aren’t irritating it. That’s where my interest in Neutrogena® Light Therapy Acne Mask came in. 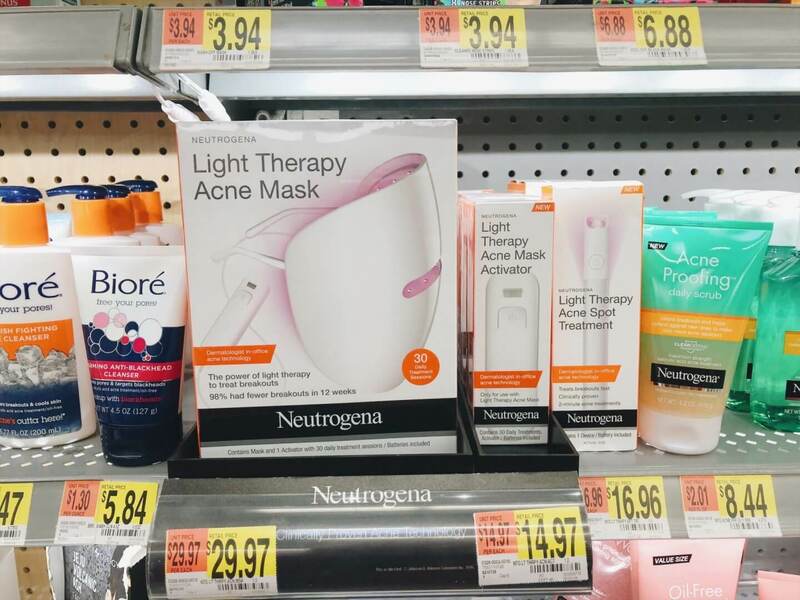 I was able to find the Neutrogena® Light Therapy Acne Mask at Wal-Mart for $30 in the skincare aisle! What a steal when you think about how much your products can add up, this is only $0.50 a day. Also, a steal when you think about how much light treatment might cost at the dermatologist office. 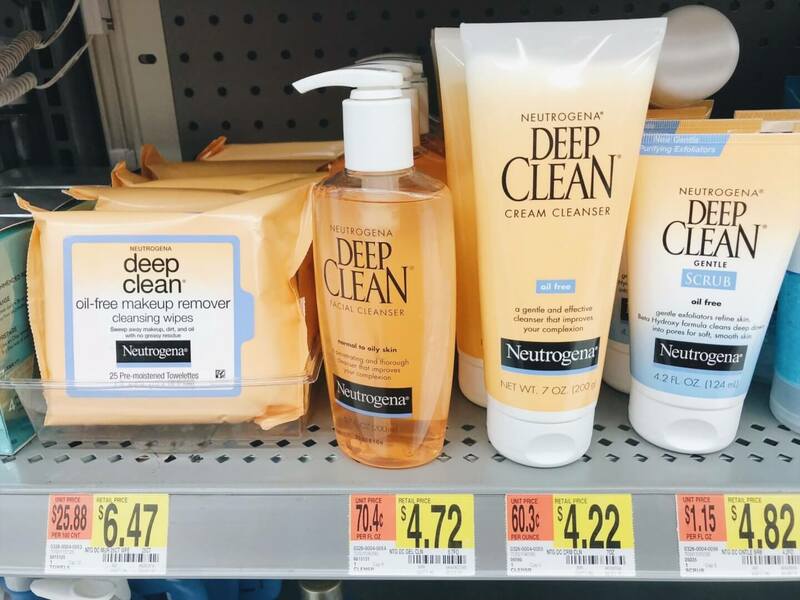 As you can see below, Neutrogena products are a reasonable price point which is why I use their products. 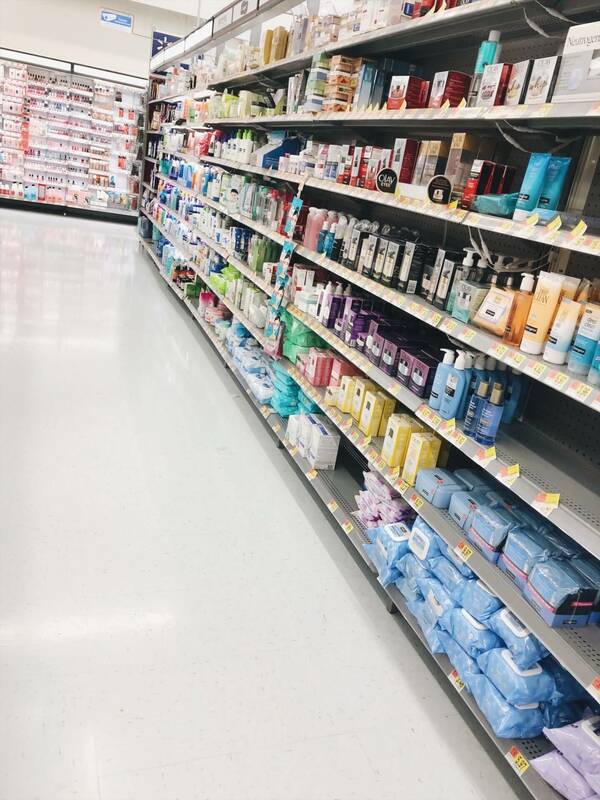 You can’t beat $4.47 for makeup wipes or $4.72 for face wash. These prices are amazing. 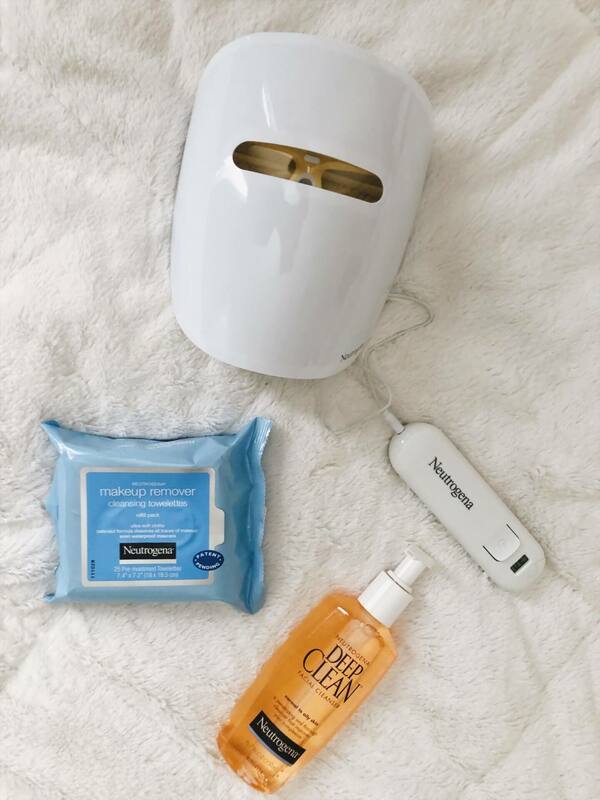 What is the Neutrogena® Light Therapy Acne Mask? The Neutrogena® Light Therapy Acne Mask is a product that was once only used in dermatologist offices. If you take a look at the image above, it’s a mask that you put on your face and relax with while it goes to work on your face. The product is lightweight and comfortable for a relaxing treatment, and you have a slot that you can see out of so you can multi-task— get a book and kick your feet up while doing so. With this product, you’ll have blue and red light therapy targeting the acne on your face. And, it won’t make your face flake! That’s been my number one issue that I’ve been trying to combat. The blue light focuses on getting just beneath the surface to target the acne-causing bacteria while the red light works on inflammation and going deeper into the skin. You are treating your face without all the chemicals, and the light targets the acne-causing bacteria. How can anything beat that? 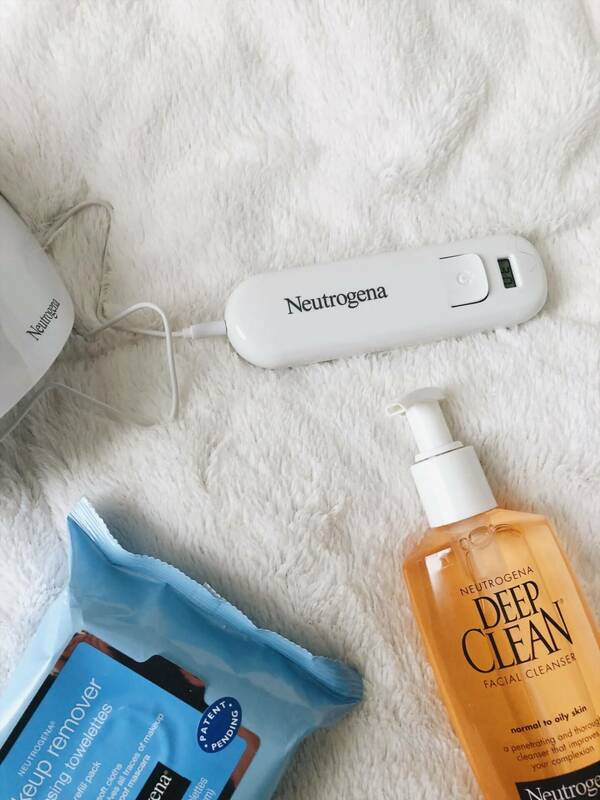 You’re utilizing the Neutrogena® Light Therapy Acne Mask that is going more in-depth than most acne products, and it gets to places that other products can’t reach. Don’t worry it’s safe—it’s a UV free treatment, so it is safe for the skin and eyes. And, it has been so effective that 98% of people tested showed results which is another reason why I had to get my hands on this. I need all the results that I can get, and many people that have used the Light Therapy Acne Mask saw visible results in their skin after one week of usage. One more thing, you can use this while you are on the go and there are no messes to clean up. That’s what I’m looking for in a product. 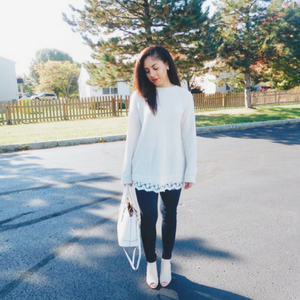 How to use Neutrogena® Light Therapy Acne Mask in your routine? When you use this product, you want to remember to remove your makeup. Naturally, you can’t fight your acne if you’re allowing something to sit on your face and clog your pores during this process. 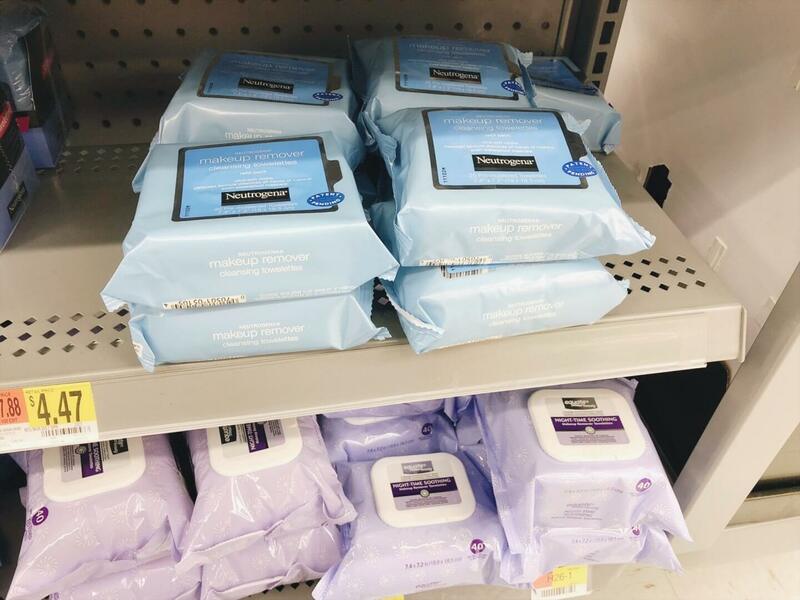 I stocked up on the Neutrogena® Cleansing Makeup Remover Cleansing Towelettes when I went to Wal-Mart. 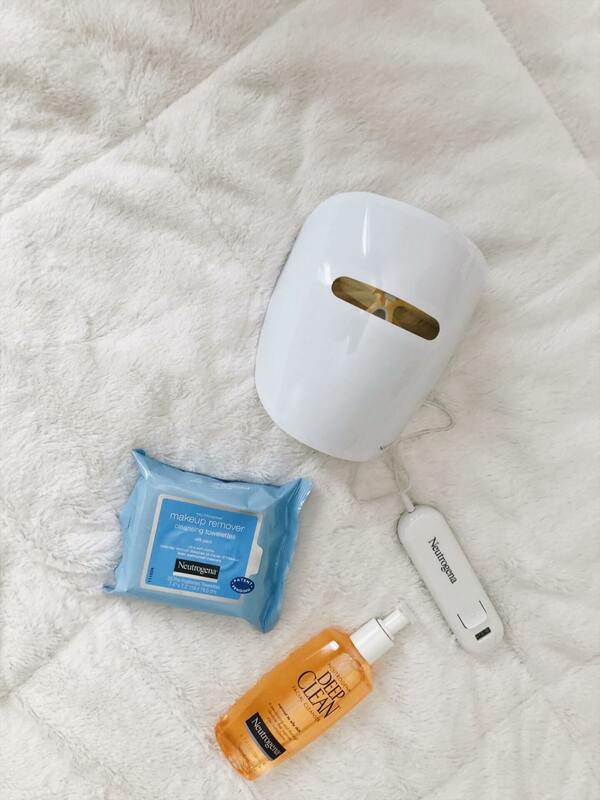 These pairs well with your Neutrogena® Light Therapy Acne Mask as you need to remove your makeup and the towelettes will get the job done for you. After you remove your makeup, you should cleanse your face. 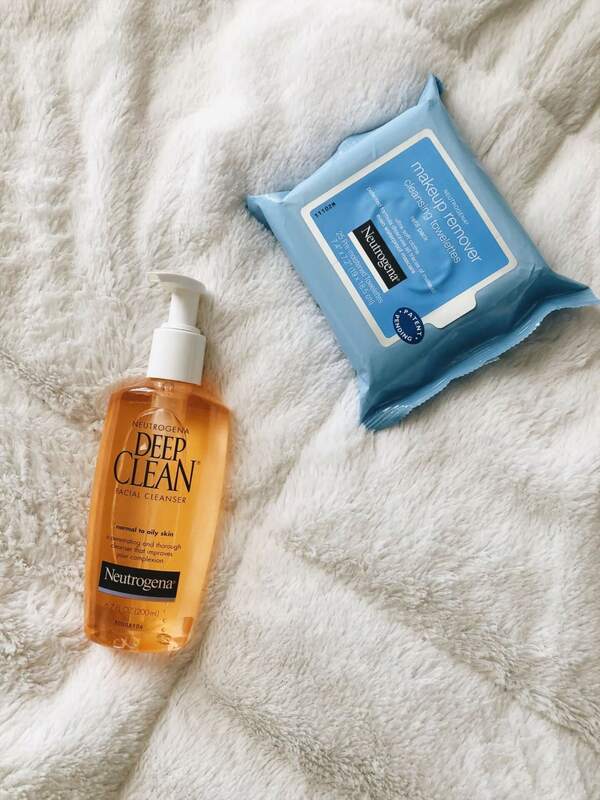 I picked up the Neutrogena® Deep Clean Daily Facial Cleanser to help me go beyond what the cleansing towelettes don’t get. Remember not to use any products that contain Salicylic Acid or Benzoyl Peroxide. Once you wash your face, you slip on this mask and chill for ten minutes. Not a long time and you don’t have to wipe it off at the end like you do other face masks. That’s a positive! You have ten minutes to do whatever you like—maybe eat a snack or stretch for some time. Use that ten minutes to do whatever. Remember this needs to be your routine for thirty. There are no skipping days; you need to stick to this. Stick to the method and reap the results! I am so excited to try this product out for the next thirty days and report back on my results. You’ll get to see if these dark spots fade and if these acne nodules will disappear. Also, I’m very excited not to have to apply different topicals to my face. Insert praise hands emoji. My new routine is underway, and I can’t wait to see the outcome. Also, you can purchase the Neutrogena® Light Therapy Acne Spot Treatment for treating less serious acne-prone skin. It’s your choice what you want to use in your life, let me know if you try out the spot treatment. Have you tried any of these products? Do you want to try out the Neutrogena® Light Therapy Acne Mask? How would this mask work in your routine?